Hungary is located in Central Europe, one of the candidate countries joining the European Union in 2004. The total area is 93,000 sq.km. The population is about 10.1 million, 60 % live in cities. About one fifth of the population live in the capital of Budapest, which is the centre of the economy and cultural life. The majority of the country is plain area; there are mountains in northern and western area. The highest peak in Hungary in the northern mountains is 1015m above sea level. 7% of the country is urban area, 65% is used for agricultural purpose, 15% is forest, and the rest are rivers, lakes, and national reserve. Hungary was established as a Kingdom in 1000 and existed as an independent kingdom till 1521. From 1521 to 1867 Habsburg kings ruled Hungary, which was part of the German-Roman Empire. The Austrian-Hungarian Monarchy was established in 1867 and existed until 1918. Between the two world wars, Hungary was a democratic republic. Following World War II the country was occupied by the Soviet army and was forced to form political dictatorship and command economy. The communist period was over in 1990, since then there has been political democracy and market economy. After World War I, two thirds of the country was joined to the surrounding states, which resulted in major Hungarian minorities there. Today about 4 million Hungarians live mainly in Romania, Slovak Republic, Serbia, and Croatia. Hungary is a democratic republic. The government lead by the Prime Minister has the real political power, the President has limited political power, but representing the country. The parliament has the legislative power, the government is the executive power. Administratively Hungary is divided into 19 counties + Budapest Capital. There are 3154 settlements (towns, villages, etc) in the country 23 districts in Budapest with local governments. There are two levels of local administration. 20 county local governments are responsible for regional matters such major roads, regional spatial planning, secondary schools, hospitals, etc. Local government of settlements and Budapest districts are responsible for local matters like primary education, certain taxation, local roads, town planning, social issues and others. The first land cadastre was introduced during the reign of King II. Joseph. The land cadastre based on cadastral survey for the purpose of land taxation. The implementation of general land taxation failed due to the opposition of the nobility. Finally the land cadastre was established in the Austrian-Hungarian Monarchy in 1875 based on detailed field survey. There were two parts of the cadastre: cadastral register and cadastral maps. The original scale, of cadastral maps 1:1440 in urban and 1:2880 in rural areas. The cadastre was established for fiscal purpose land taxation, based on the yielding capacity of the land. The cadastral system also supported the legal (Grundbuch) system. The descriptive part of the Grundbuch (parcel number, area, address, cultivation, value of agricultural land, etc.) based on cadastral mapping data. Legal registries (Grundbuch) were established at local courts for registration and updating of ownership data, mortgage, easements and other rights, facts related to land and real estate properties according to law. In 1972 there was a decision to integrate the Cadastre and Legal Registry on legal basis and institutional level forming the Unified Land Registry System. The integration procedure was completed in 1981. During the socialist period (1949-90) Hungary was the single socialist country operating the Land Registry, and later the Unified Land registry, without any gap. As a result of this there was a fully operational unified land registry system in 1990 when Hungary introduced the multi party democracy and the market economy. The institutional network of the Unified Land Registry System, called Land Office, under the Ministry of Rural Development, Department of Land Administration and Geoinformation, 121 District Land Offices are responsible for maintaining, updating cadastral maps and legal data (ownership and other rights, mortgage, easements, restrictions). 20 County Land Offices are second instance offices and also responsible to supervise district land office activities. The FÖMI Institute of Surveying Cartography and Remote Sensing, a national agency, is responsible, among others, for maintaining national control point network, topographic mapping, developing, supporting Land Offices IT systems, etc. Cadastral survey for legal purpose and preparing survey documents of changes in cadastral map data are the licensed surveyor responsibility. There are 1700 licensed surveyors. Many of them run private business others are employed by bigger survey firms producing new digital cadastral maps, which are checked and certified by Land Offices. Land offices also employ licensed surveyors. In the legal part, lawyers, notaries responsible to prepare and counter sign deeds, legal documents of ownership changes and other documents for transactions related to land and real estate properties. The Hungarian Society of Surveying Mapping and Remote Sensing (MFTTT) represents all kind of surveyor and cartographer profession. Private surveyors have a section in the association. There are 1200 members in the society, while the total number of surveyors in Hungary is approx. 5000. Cadastral surveying, cadastral work for legal purpose is the monopoly of licensed surveyors in Hungary. The majority of cadastral surveys, mapping have been carrying out by the private sector. The Institute of Surveying Cartography and Remote Sensing (FÖMI) under the Ministry of Agriculture and Rural Development issues the license to surveyors. There are two universities providing education and diploma in surveying. The Budapest Technical University has a five years course of study for MSc. in Surveying and IT knowledge. The course is rather theoretical teaching traditional subjects and IT, GIS knowledge. About 30 students graduate annually. The West Hungarian University College of Geoinformatics in Székesfehérvár has three years course of study gives BSc. Graduation but recently MSc graduation as well. There are three faculties: land surveying, land consolidation, land registry matters. About 40-50 students graduate in regular course and 20-30 in correspondence course annually. The Hungarian Unified Land Registry System is the integration of Cadastre and Legal Registry (Grundbuch) on legal basis and institutional level and serves different purposes. Legally guarantees the security of ownership and other rights related to land and property in the same time supporting the land market providing statistical data to the government and decision makers for economic planning and providing data and services for the major external users and the entire society. The multipurpose nature of the Unified Land Registry System is the basic information for external users as local governments, banks, public utilities, lawyers, surveyors, etc. The cadastral map is compulsory to use for spatial planning and any land information system. There is only one type of Unified Land Registry System in Hungary. All state, private, co-operative land and real estate properties have been registered including condominium units (apartments). 2) other real estate property. c) cellar, underground garage, construction with direct access to public domain (street, road). The cadastral maps show all land parcels with boundaries and buildings. Boundaries based on direct survey, creation of new parcel boundaries-subdivision, road alignment, etc. require cadastral survey, work and legal procedure. In case of other independent properties scaled lay out plans of condominium about each level represents the map. All types of real properties can be mortgaged and are transferable. If a land parcel or part of it is occupied undisturbed for a continuous period of 15 years a person(s) may apply at the court for adverse possession. For changing of title legal court decision is needed. All land parcels and real properties have been registered in Hungary and cadastral maps cover the whole country. There are 7,3 million land parcels and about 2,6 million other real estate properties (condominium units and others). III. Mortgage, restrictions, easements and other rights, facts according to law. 2) Mapping part: The cadastral map consists of parcel boundaries, parcel numbers, buildings and other construction, street names and addresses, control points, easements, in rural area sub parcel boundaries with cultivation. Both the legal and mapping part are updated daily and simultaneously to guarantee the data consistency required by the nature of Unified Land Registry System. The mapping and property sheet data must be consistent. Control points are registered and maintained in land offices. There are 58,100 control points (I-IV), since 2007 an active GPS network is operational with 34-36 permanent stations. There were 71,076 analogue cadastral map sheets covering the whole country. 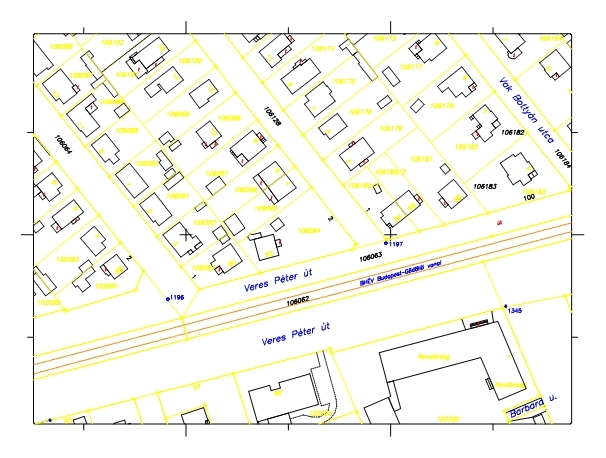 Since 1st January 2008 all cadastral maps have been in digital form. All the survey plans, measurements must be archived. The legal part, property sheets are 100 % in digital format as well. The old analogue cadastral maps were varying in scale and accuracy. The scale was 1:1000, 1:2000 in urban and 1:2000, 1:4000 in rural areas but we still have 1:1440, 1:2880 scale maps. The majority of cadastral maps have been graphical but there were many numeric maps in urban areas (Budapest and other cities). In case of numeric maps boundary points have co-ordinates based on field survey, boundary points shown by circles. Originally cadastral mapping was carried out in different projection systems. The national projection and grid system was introduced in 1980. Since then the national grid system is compulsory to use in new cadastral mapping and the new digital cadastral maps have been introduced in national grid system as well. In 1990 there were no digital cadastral maps in Hungary. The National Cadastral Program started in 1994, supporting the new digital cadastral mapping. The majority of digital cadastral mapping in urban area is based on field survey and less in digitalizing old cadastral maps. Using field survey the quality of digital cadastral maps is good but very expensive and time consuming. In 2002 only 15% of cadastral maps were in digital form. It was important to accelerate the progress of digital cadastral mapping. At the end of 2002 it was decided to introduce a new approach digitising graphic cadastral maps. The digital cadastral mapping was completed and introduced in 1st January 2008. The content of cadastral map: The cadastral map shows parcel boundaries, boundary points, parcel numbers, street names and address, horizontal control points, height points, buildings and other constructions, boundary of cultivation in rural area. The cadastral mapping information is the mapping part of the Unified Land Registry System. The common data of cadastral map (parcel number, address, area, etc. must be consistent with the descriptive data of the property sheet. This is one of the basic requirements of the Unified Land Registry System. The updating and maintenance of common data is a simultaneous task of the mapping and legal part. Before Hungary introduced the Unified Land Registry System the Cadastre also supported the legal registry and cadastral map served information to the economy. Today digital or analogue cadastral maps (land registry map) are the basic information to establish different database supporting development and environmental interests. The land registry map, according to law, is compulsory to use for spatial, town planning, building regulations and basic map for public utility companies. For local governments, municipalities land registry map is basic layer managing their activities. Extracts of land registry map (cadastral map) are widely used for different purpose by the public. 3) Development of market driven data services. Digitalisation of the condominium lay out plans. Digitalisation of the archived deeds, contracts, etc.